South African President Jacob Zuma will pay a state visit to China next month, a sign of steadily expanding ties between two countries that will host a new $100 billion BRICS Bank and its African regional center. In a press briefing in Pretoria on Thursday, South Africa’s Foreign Minister Maite Nkoana- Mashabane said the leaders of the two countries will adopt the “China-South Africa 5-10 Year Framework on Cooperation” during Zuma’s visit to speed up implementation of joint projects. Zuma will be in China from 4–5 December at an invitation by his Chinese counterpart Xi Jinping. The two leaders will “discuss ways of supporting our industrialisation agenda by agreeing to invest in the development of Science and Technology, agro-processing; mining and mineral beneficiation, renewable energy, finance and tourism”, said Mashabane. The visit will also seek “to ensure that our relations with China remain central to realising our developmental agenda through our foreign policy”, added the South African Foreign Minister. The accession by South Africa to the membership of BRICS was an important milestone in the relations between the two countries, she noted. Beijing’s relations with South Africa have flourished in the past decade with massive Chinese investment across the country and the African continent. South Africa-China trade jumped by 32 per cent between 2012 from R205 billion to R270 billion in 2013, making China the country’s largest trading partner. 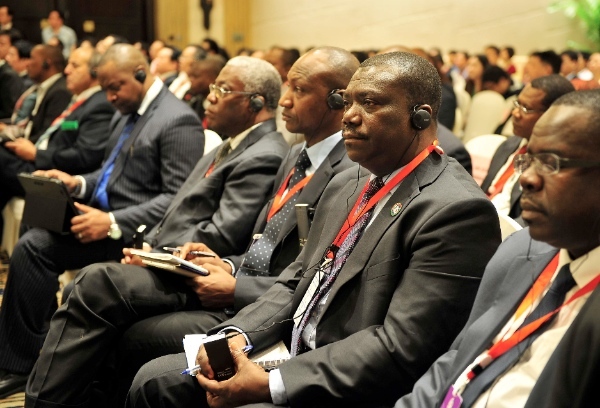 The South African Minister also underlined that “China regards South Africa as a key partner in advancing its relations with the African continent”. South Africa through its partnership with China is joining in attempts by the BRICS bloc to upend the international order by fashioning a coalition to resist what these countries view as American arrogance. “While the two countries are strikingly different in their cultural, political and socio-economic orientation, they are very close in the positions they take on key issues affecting mankind,” said Mashabane referring to common positions on Syria, Palestine and Iraq. South Africa and China have stepped up closer coordination in foreign policy, notably in the United Nations, BRICS and Forum on China-Africa Cooperation (FOCAC). President Zuma met his Chinese counterpart Xi Jinping during the G20 Summit earlier this month in Brisbane, where the BRICS leaders discussed the status of individual ratification of the BRICS Bank by their respective parliaments. South Africa will establish an African regional center for the bank in Johannesburg. “The decision to locate its African Regional Centre in South Africa not only raises the level of cooperation between China and South Africa in addressing global challenges, but it is yet another clear indicator of South Africa’s growing significance in driving the African Agenda,” said the South African Foreign Minister on Thursday. After some tough rounds of negotiations, BRICS have created not only a new $100 billion Development Bank, but also a $100 billion foreign currency reserves pool during a plenary meet in Fortaleza, Brazil earlier this summer. The five Finance Ministers will constitute the Bank’s board which will be chaired by Brazil. The Bank will initially be involved in infrastructure projects in the BRICS nations.